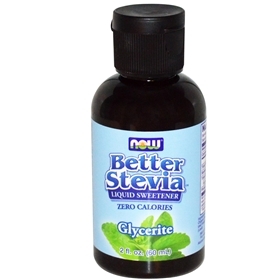 For dieters, stevia is carbohydrate free, and contains no calories. This makes it possible for dieters to satisfy sweet cravings and used as much stevia as they enjoy, without ruining their eating plans. Some studies have shown that stevia can lower blood pressure. One double-blind, placebo controlled study demonstrated that stevia taken at doses of 250 mg, three times a day for one year resulted in significant and lasting decreases in systolic and diastolic blood pressure in patients with moderate hypertension. Suggested Usage: As a dietary supplement, take 3 to 5 drops as desired. Sedimentation may occur. Shake well before using. Other Ingredients: Vegetable Glycerine and Water. Contains no: sugar, salt, yeast, wheat, gluten, soy, milk, egg, shellfish, preservatives, artificial colors, artificial flavors or artificial sweeteners. Vegetarian/Vegan Product.